Gather all the information you need for a winning business analyst resume. Is your resume delivering on your intended goals, or do you need to take a closer strategic look at this work in progress? To be a successful candidate for business analyst jobs, resume expert Kim Isaacs says it helps to have a comprehensive resume. 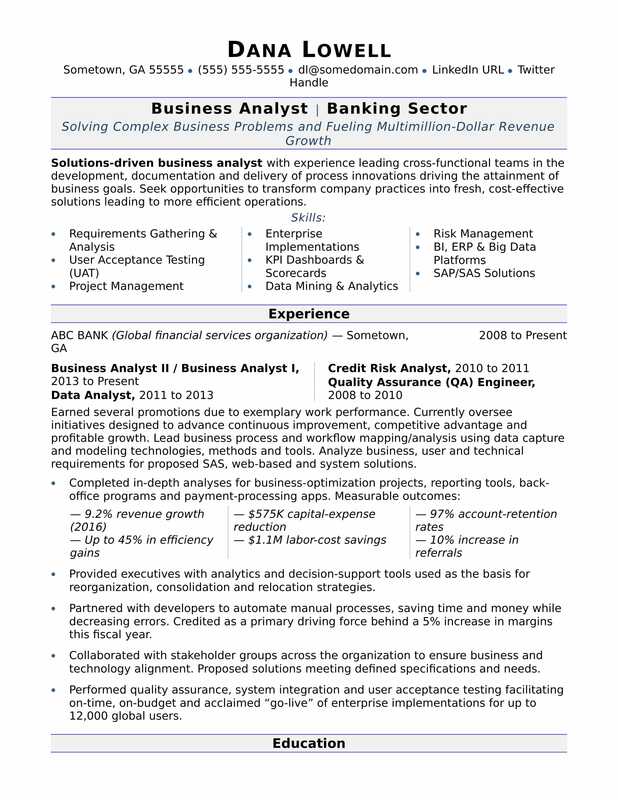 To see how you can launch your career, view this sample resume for a business analyst that Isaacs created below, or download the business analyst resume template in Word. Jobs for business analysts are projected to grow by 7% (or 3,800 jobs) from 2016 through 2026, according to the Bureau of Labor Statistics (BLS). You'll find the highest level of employment for this job in the following states: California, Texas, Virginia, New York, and Florida; and in the following metropolitan areas: Washington D.C., New York City, Los Angeles, Baltimore, and Boston. As a business analyst, you can expect to earn a median wage of $75,240 per year, or $36.17 per hour, according to the BLS. Additionally, you can learn about business careers or search for business analyst jobs on Monster. Earned several promotions due to exemplary work performance. Currently oversee initiatives designed to advance continuous improvement, competitive advantage and profitable growth. Lead business process and workflow mapping/analysis using data capture and modeling technologies, methods and tools. Analyze business, user and technical requirements for proposed SAS, web-based and system solutions. Provided executives with analytics and decision-support tools used as the basis for reorganization, consolidation and relocation strategies. Partnered with developers to automate manual processes, saving time and money while decreasing errors. Credited as a primary driving force behind a 5% increase in margins this fiscal year. Collaborated with stakeholder groups across the organization to ensure business and technology alignment. Proposed solutions meeting defined specifications and needs. Performed quality assurance, system integration and user acceptance testing facilitating on-time, on-budget and acclaimed “go-live” of enterprise implementations for up to 12,000 global users. Since your resume is likely to be the very first contact a hiring manager has with you, it's critical to make sure it's a strong demonstration of your skills as a business analyst, but also the value you'd bring to a company—something a professional like you can surely appreciate. Could you use some help fine-tuning your resume's details? Get a free resume evaluation today from the experts at Monster's Resume Writing Service. You'll get detailed feedback in two business days, including a review of your resume's appearance and content, and a prediction of a recruiter's first impression. Take action today and find a new job sooner than you think.